It is not news that the language of institutional long term care needs some work. Even CMS notes language by encouraging eliminating labels such as “feeder” in its 2009 interpretive guidance for Tag F241 Dignity. Some are working toward new language, many want to. What is still missing, however, is a language transformation of what is said to whom and how it is said, that conveys the values of a changed culture. 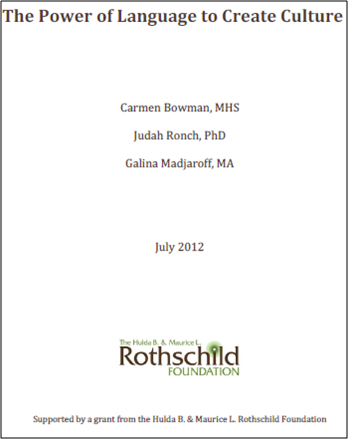 This session, built upon a recent Rothschild funded paper with the same title co- authored by Carmen Bowman, Dr. Judah Ronch, and Galina Madjroff describes the unintended and negative consequences of the traditional, institutional language of long term care and the way it shapes the cultural experience psychologically for all who live and work there, as well as suggestions for some positive future directions of language and strategies to get there (90 minute session at the least, more time is better). The paper goes into the psychology of language, role model communities, old language and new language to consider. We can't change Medicaid reimbursement today, but we can change language. It takes no money to change undignified language to dignified. And, truly, language has power to create culture. What kind of culture is your langugae creating? Personally and corporately? 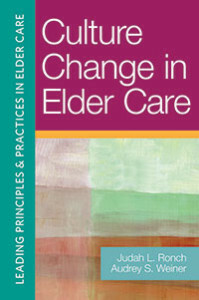 ﻿﻿An additional resource for language is in this book Culture Change in Elder Care with a chapter also entitled The Power of Language to Create Culture authored again by Carmen Bowman, Judah Ronch, and Galina Madjaroff. There are many other topics and contributing authors to the overall subject of culture change. 2013.